A few weeks ago, Dan Zettwoch wrote a post that used sentence diagrams to explain illustrations and comic panels. A work of expository genius. In Dan's honor–and also to unburden my scanner of images that had been sitting on it, unprocessed, for some time–tonight I bring you the opposite. 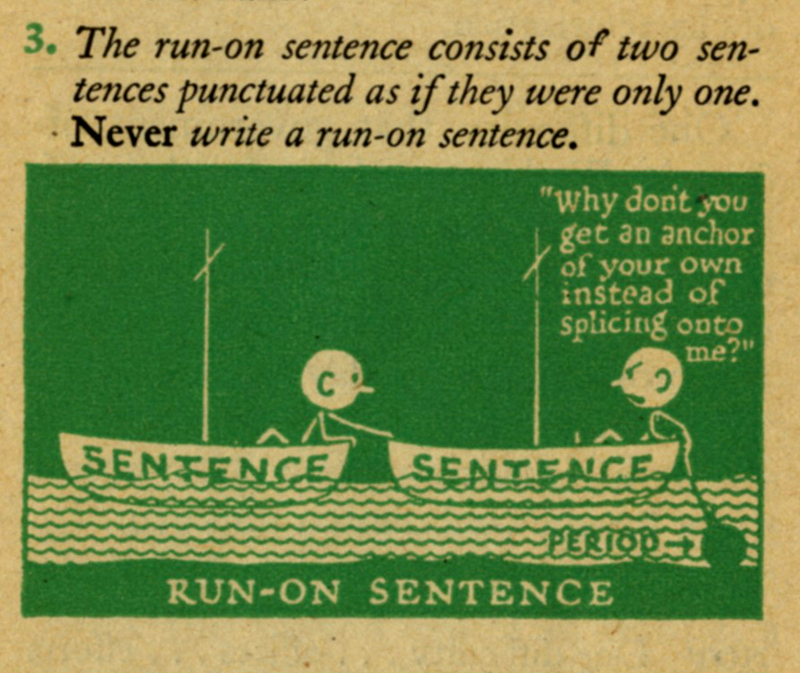 Courtesy of Reader's Digest, a series of illustrations designed to enliven the subject of grammar. They come from a set of pamphlets issued by the magazine, publications intended to aid teachers of composition on the college level. Published in 1944. Clear, crisp expository writing is always in short supply. Truly, I applaud the effort, and would happily hand off such advice to students, who now as then who struggle to keep noun and verb in close proximity, etcetera. Alas, the uncredited cartoonist who labored to serve the text was up against it. The dominance of text in these images is a clue to their insufficiency for abstract explanations. But I am partial to the crime scene. And the madcap sentence procession. Illustrated heckling, of supposed variety. Clever, and true. I'm not sure what this is, but I'm not persuaded by it. Who is FC? His monogram appears in every image. Any attribution detectives out there? The boating metaphor for the run-on sentence is a bit forced, but really, give the guy a break. Would you want this assignment? And really, the advice is spot on. Never! Have you ever read Leviathan? Sentences that last pages. (Yes, I know, that's a fragment.) Today we have shockingly informal stream-of-consciousness chat-a-thon "texts" that pass as writing (as opposed to typed speech). Here's a text page, to give a sense of how the pamphlet worked, and in what voice it was written. No-nonsense admonitions, leavened by visual wit. The illustrations' real job was to prevent textual glaze-over. Re: 10j: or, alternatively, never use like as verbal junk. "I'm, like, at the mall." Or as a synonym for say or said. As in, "He was like, ..."
Abraham Lincoln was like, "With malice toward none, with everybody like chill, I am like so ready to get this thing over with." These pamphlets were scooped up on my behalf by the ever-alert Linda Solovic, whose estate-sale instincts are legendary. Thanks, Linda!